Technically demanding and at times furiously paced, two newly-identified Mozart works are helping scholars complete their assessment of the maestro's very early achievements. The childhood creations unveiled Sunday - an extensive concerto movement and a fragmentary prelude - provide yet more proof the Salzburg native was a true prodigy. And maybe a bit of a showoff. "We have here the first orchestral movement by the young Mozart - even though the orchestral parts are missing - and therefore it's an extremely important missing link in our understanding of Mozart's development as a young composer," said Ulrich Leisinger, head of research at the International Mozarteum Foundation after a presentation of the pieces in Mozart's native Salzburg. Leisinger said Mozart likely wrote the two newly-attributed pieces when he was 7 or 8 years old, with his father, Leopold, transcribing the notes as his son played them at the keyboard. "There are obvious discrepancies between the technical virtuosity and a certain lack of compositional experience," it said. At Sunday's presentation at the Mozart residence, Austrian musician Florian Birsak, an expert on early keyboard music, played the two pieces on the maestro's own fortepiano for a throng of reporters, photographers and camera crews. Later, Birsak explained how learning to play the concerto movement was a bit of a challenge because of complex aspects such as "large jumps." To Robert D. Levin, who provided an orchestral accompaniment to the concerto, the young Mozart wanted to show "everything he could do" in the piece. "What the composer expects of the player in racing passagework, crossed hands and wild leaps is more than a bit crazy," said Levin, a pianist and Harvard University professor internationally recognized for his completion of Mozart fragments. Both works were identified as part of a larger investigation of the foundation's Mozart-related materials, including letters, documents and more than 100 music manuscripts - some in the hand of the composer, others transcribed by contemporaries. While "Nannerl's Music Book" has been in the foundation's hands for more than a century, the pieces were considered anonymous creations until Leisinger and his team took a closer look. "These two pieces struck us because they were so extravagant," Leisinger said, adding that the two works share a number of similarities but that the prelude - believed to have been written after the concerto movement - was "much more refined." "One could almost get the impression that Leopold said to his son, 'Look, you've written this crazy concerto movement, try to do it better, a little bit more concise,' and as a result we ended up with this prelude-like movement," he said. Posthumous discoveries of Mozart pieces are rare but not unheard of. 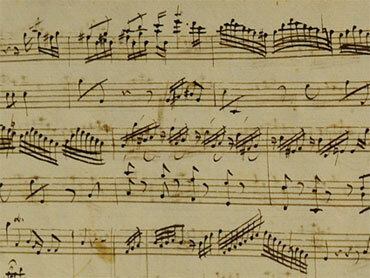 In September, Leisinger announced that a French library had found a previously-unknown piece handwritten by Mozart. That work, described as the preliminary draft of a musical composition, was found in Nantes, in western France, as staff members went through the library's archives. Leisinger said the library contacted his foundation for help authenticating the work. The latest finds add "important details" to what we know about the young Mozart's work, said Christoph Wolff, professor of music history at Harvard University, who is also director of the Bach Archive in Leipzig, Germany. "The Salzburg discovery offers significant insight into the earliest accomplishments of Mozart," Wolff said in an e-mail to The Associated Press. The Salzburg-based foundation, established in 1880 and a prime source for Mozart-related matters, seeks to preserve the composer's heritage and find new approaches for analyzing him.